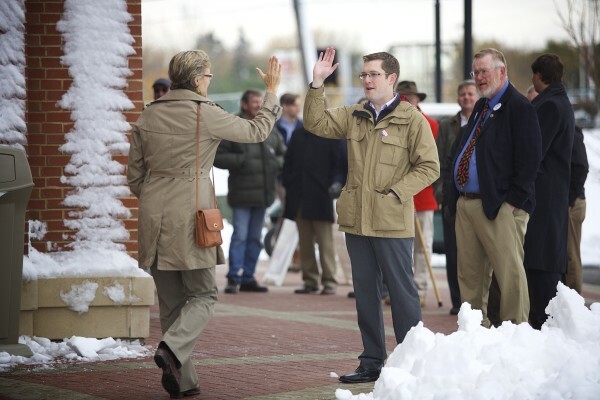 City Council candidate Ben Sprague receives a high-five from a voter Tuesday morning at the Cross Insurance Center in Bangor. BANGOR, Maine — Voters returned two incumbents to the City Council and elected a former state lawmaker Tuesday in a five-way battle for three openings on the Bangor City Council. The top vote getter in this year’s council race was Ben Sprague, the current council chairman, who received 7,092 votes. He was closely followed by Joe Baldacci, also an incumbent candidate, who had 7,063 votes. Winning the third position was Sean Faircloth, with 5,234 votes, according to unofficial election results released late Tuesday night. Sprague, a Harvard University graduate and financial adviser, has served as council chairman for the past year. After the next members of the council are elected and sworn in, the full council will decide who should take the chairmanship for 2015. Baldacci is a Bangor-based lawyer who was elected to the council in 1996 and again in 1999, serving as City Council chairman in 1998. He was elected again in 2011. Faircloth is a five-term state legislator who was selected to serve as majority whip in his final term in 2008. In 2009, the former lawmaker left the state to become executive director of the Secular Coalition for America in Washington, D.C.
Justin Freeman, a political newcomer, and Gerry Palmer, a former five-term councilor who served as council chairman in 2008, also ran, but both fell short of winning a council spot, with 3,671 and 3,465 votes, respectively. The Bangor School Committee race was uncontested, with three candidates running for three openings. Taking those seats were incumbent Warren Caruso, with 7,050 votes, Susan Sorg, who had 6,390 votes, and Marlene Susi, with 6,461 votes. Correction: An earlier version of this story reported that Ben Sprague received 6,018 votes, Joe Baldacci received 5,980 votes, Sean Faircloth received 4,409 votes, Justin Freeman received 3,125 votes, Gerry Palmer received 2,804 votes, Warren Caruso received 5,959 votes, Susan Sorg received 5,408 votes and Marlene Susi received 5,452 votes. Sprague received 7,092 votes, Baldacci received 7,063 votes, Faircloth received 5,234 votes, Freeman received 3,671 votes, Palmer received 3,465 votes, Caruso received 7,050 votes, Sorg received 6,390 votes and Marlene Susi received 6,461 votes.